If the GSX-R was a footballer this would the equivalent of a testimonial match – albeit accompanied by the sound of screaming engines, burning rubber and a Texan drawl. Because almost 10,000 GSX-R owners, fans and enthusiasts have gathered at the Kent circuit to celebrate 16 years of the most famous four letters in biking. The paddock car park is a sea of Suzukis. Every Gixer from the blood line is here. From the GSX-R50 to the streetfighter favourite 1100. From the newest member of the clan, the 1000, to the grey import 400, they are all represented and parked according to year and model. Along with the bikes there is beer, there are bands and there is even a bucking sheep. Crowds shake with laughter as the mechanical ewe spends the day spectacularly unseating even the hardiest of riders. But this is not the only star. Wandering around the paddock and pits (specially open to the public today), you find an autograph hunter’s dream. Suzuki has left space in the official programme for signatures to be filled in – 15 autographs and you have a full set – though on meeting Frankie Chili, several female fans opt to offer him their chests to scrawl on. Gentleman that he is, Frankie carefully obliges. Like you do. A constant huddle of fans surround the Crescent Racing garage, as famous faces wander past, stopping, chatting and signing autographs. The figures of Kevin Schwantz, John Crawford, Niall Mackenzie and Shane Byrne spend the day hooning around the track and then heading back to hang out with fans in an atmosphere that is so relaxed, many punters can’t believe they are actually meeting their heroes.
" I have an RGV250, Lucky Strike leathers and a Schwantz lid, " says Ricky Hoquee from Stevenage, Herts, who needs to sit down after all the excitement. " Kevin is my hero, I’m a life-long fan and now I have met him, it’s amazing. " On the track, Crawford nails his factory 750 in an attempt to break the Brands Hatch Indy circuit lap record. He misses it by 0.4 seconds. Meanwhile, " Shakey " Byrne’s stand-up wheelies and Chili’ burn-outs bring cheers from the crowds sunning themselves on the banking. Even punters themselves get to ride the hallowed circuit at various times during the day in a series of parade laps – though some can’t resist twisting the throttle for the odd blast past the bloke in front, which at times includes Prodigy front man Keith Flint on a GSX-R600. Meanwhile, stunt rider Kevin Carmichael spends most of his time on one wheel of his GSX-R1000 (take your pick from a 300 yard stoppy or a 90° wheelie). 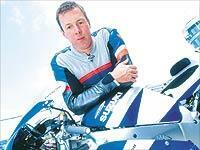 Even rally driver and Suzuki nut Colin McRae gets in on the act on Crawford’s 750. One of the most impressive rides of the day comes from Schwantz, who hammers around on a Crescent GSX-R1000 complete with his famous No34. He is only a couple of seconds off the pace. Not bad for someone who officially retired back in 1995 and hasn’t ridden around Brands in 14 years.
" I love it in Britain, " he says. " My race team was based here so I always thought of the British GP as my home round. Being from Texas, I never could claim California as home – and I hated Laguna Seca anyway! " The idea of the GSX-R as an icon is pretty new to Schwantz, who comes from a land where people rarely gather for anything with two wheels unless it’s laden with chrome.
" You guys have caught on to this sports bike thing over here, " he says. " If we had one of these festivals in the States, a few people would turn up – but no more than that. Every time I turn in at Paddock Hill I look out over a bike park full of GSX-Rs and think ‘wow’. " As Crawford flies past on his works superbike, Schwantz – who has been riding with the Scot for most of the morning – concentrates hard on the line he’s taking. " That’s where he’s killing me, " he says, brain clearly whirring. Now he wants to swop bikes – his GSX-R1000 may be the bike which will race in the British championship next year when the 1000cc rules come in, but he wants this year’s 750. " People keep asking me how good my 1000 is on the road at home, but I prefer my 750 because I can wring its neck. The 1000 is too fast. " Thoughts immediately turn to all the GSX-R1000 owners who can now say " my bike’s too fast for Schwantz " . However, it is four wheels not two that brings the biggest laugh of the day. Having finished a few bike laps in the company of Schwantz, ex-world rally champion McCrae takes out some aggression on a poor Ford Focus. Members of the crowd are randomly pulled out for a lap of Brands they are never likely to forget. Even Schwantz is impressed. " I nearly had to change my pants after that, " he jokes, fresh from the passenger seat. McRae might be the most famous British rally driver ever, but he’d much rather be on a bike, which is handy as Suzuki has given him a GSX-R1000 to keep for a while. You might think he’s achieved every childhood dream already, but a career on four wheels was a compromise. He says: " I wanted to be a bike racer when I was a teenager – but I couldn’t get the support from my mother, so I ended up in cars. For me, this is the most exciting thing you can do. I’ve driven a Formula One car and this is better. I’d be on the bike all day if the tank was big enough! " McRae’s time as an owner of a GSX-R1000 means he knows all about the Suzuki flagship, but the 750 he’s using today puts a broad smile across his face. " It’s like going from a road car to a rally car, " he said. " You don’t have to guess what it will do – you tell it to do something and it does it straight away. " McRae’s number is called for some more track time and he eagerly grabs his Arai. He might make his living on four wheels, but this is where his heart is – along with the 10,000 other GSX-R riders here today.